In the car, Charisse Stinson said, she was suddenly hit in the head and blacked out, she said. When she came to in a nearby park, Antwan, his Toyota Camry and her toddler were all gone. Still smarting from a fresh head wound Saturday night, Charisse Stinson described a parent's nightmare. She had been walking down the street with her 2-year-old son, Jordan Belliveau, when a Toyota Camry pulled up, she told investigators. The driver said his name was Antwan, and he asked if mom and son needed a ride. In the car, Stinson said, she was suddenly hit in the head and blacked out, she said. When she came to in a nearby park, Antwan, his Toyota Camry and her toddler were all gone. Police in Largo, Florida, a town nearly 20 miles northwest of St. Petersburg, began a statewide search for the 2-year-old, 30-pound boy. They said he was possibly in the company of a man known only as Antwan - a roughly 25-year-old black man with dreadlocks and gold teeth who was wearing black "And1" basketball shorts and a white tank top. Investigators were spurred into action. They released a sketch of the suspect. They searched ponds and dumpsters and woods. In a news conference, they spoke directly to Antwan, asking him to drop the boy off at any safe place. And they told the public, as one investigator vowed, "we're going to find Jordan." But behind the scenes they had doubts, according to the Tampa Bay Times. Records from social workers showed concerns about how Stinson, 21, was caring for the boy - who had been returned to his mother just a few days before he disappeared. The boy's father had doubts about the veracity of Stinson's story. And at Stinson's home, investigators found tiny toddler clothes, covered in blood. Late Tuesday, they learned the truth, then promptly charged Stinson with felony child abuse and murder. She told investigators that Jordan had an "unexplained, serious injury to his right leg," according to an arrest affidavit. 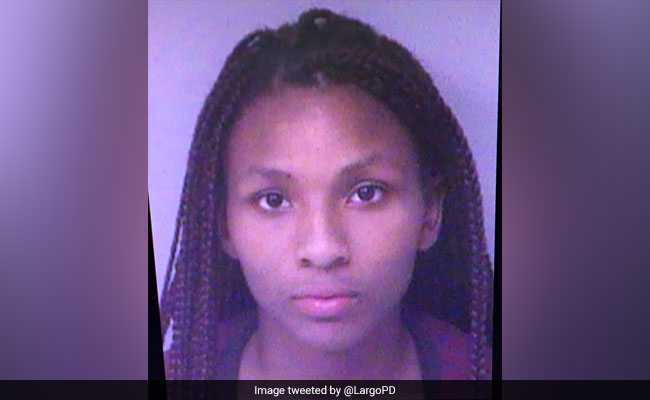 During "a moment of frustration," Stinson told investigators "she struck the victim, her child, in the face with the back of her hand which in turn caused the back of his head to strike an interior wall of her home." He had seizures all during that night, the police documents said, and his condition worsened. Instead of taking her dying son to the hospital, police told reporters in a news conference, Stinson took him to a secluded wooded area and hid his body. After disposing of her son's body, Stinson inflicted a head wound on herself, then walked across the street to the Hampton Inn, a made-up story in tow. Investigators found Jordan's body Tuesday, although they wouldn't say how. His wounds were consistent with what Stinson described in her confession. In an interview with reporters, Largo Police Lt. Randall Chaney said detectives were suspicious of Stinson's story from the beginning, but were not going to discount reports of a missing child without doing everything they could to investigate his mother's claims. Chaney said that during Stinson's confession, she never showed remorse. "During her interview she would constantly change what she was saying based on the line of questioning," Chaney said. "There was no feeling of any remorse, only her attempt to escape the reality of the story by making things up as she went. That included Antwan, who Chaney said investigators now know was a figment of Stinson's imagination. "We do not believe there was an Antwan," he told reporters. "There was no Antwan related to this case. We don't believe there was a white Camry. That was all fabricated by Ms. Stinson, to help cover what she had done." And with that, "Antwan" joined a long list of imaginary black boogeymen made up to deflect attention away from heinous crimes. Perhaps the most famous is Susan Smith, a South Carolina woman who, in 1994, claimed a black man hijacked her car with her children in it. Later, she admitted that she had driven her car into a lake with her children inside. In 1989, Charles Stuart claimed a black man jumped into the car as he was driving his pregnant wife home from Lamaze class, and shot her to death. After their baby boy, delivered prematurely, also died, the Boston police and media zeroed in on a succession of suspects, eventually singling out Willie Bennett. Charles Stuart committed suicide after his brother Matthew revealed to police that it had all been a lie, and that Carol Stuart was killed for insurance money. Boston was left to grapple with how eagerly it believed a black man was to blame. In 2009, Bonnie Sweeten claimed that she and her 9-year-old had been kidnapped by two black men in a truck, according to CBS News. In reality, she had taken her daughter to Disney World. Sweeten had swindled loved ones and the law firm she worked at out of nearly $600,000, and was trying to avoid getting caught. And in 2016, a Jackson, Georgia, police officer said she was the victim of an unprovoked attack by a mentally disturbed 250-pound black man. A short time later, officers said she'd lied about the attack and shot herself in her bullet-resistant vest to sell the story. Sherry Hall's story of a crazed black man cavalier enough to attack a police officer spread fear in her city of 5,000 - fear that Hall stoked during television interviews. "For him to have such a disregard to human life really angers me and upsets me," she said amid a manhunt for the man she had described. "If he'll do this to an officer, how much more will he do to a citizen on the street."